his is a very rustic park. It is old and not for today's rigs. One loop has no services and the other has electric only. The road into the camping sites is very narrow with low branches- two rigs could not pass and a car and a rig would be very tight. We struggled to back our 33ft TT in to the site with low branches, trees sticking out into the site, narrow road. The office was closed when we arrived with no signage saying when it was open. And, there is no dump station!! While the sites were all nicely wooded, this park is only good for under 25ft campers or tents. We camped at Rice Lake State Park in a Travel Trailer. Blackhawk Park (COE), De Soto, WI This park has 2 distinct sections. The older, double loop section has spots that are closer than the usual COE spacing but they are all nicely shaded. The longer single loop, which has the only bathhouse, has nicely spaced spots (some on the Mississippi back channel), lots of grass, but no shade at all. I'm told the fishing here is very good (saw lots of fish behind caught but we didn't fish here). Only electric hookups and water spigots several places throughout. The older section has a couple of buddy sites but the newer section does not. There is a train that passes (as they do along all of the Mississippi River) but there is enough of a wooded buffer that you barely hear it. I would stay here again and pick my site based on the season - shade vs no shade. We camped at Blackhawk Park COE in a Travel Trailer. The campsites here are nicely spaced and well shaded BUT the road is very narrow and our site, #104, was VERY difficult to get our 33ft TT into. The site is perpendicular to the road and there is a huge rock directly opposite. My husband actually had to drive back around the loop in the wrong direction to have half a chance. The other campers who helped us said that everyone has had the same problem getting in. Angling the sites would help a great deal but they have not done that. Once we were in, the site was level but we head to unhook the truck immediately as the site was not long enough for both. I would recommend this park for rigs under 25ft although I saw plenty of bigger ones. Just expect a challenge getting it parked. 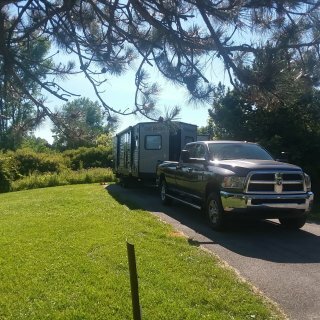 We camped at Bewabic State Park in a Travel Trailer. There are 3 campgrounds here, one of them is under construction currently. We stayed in the Pines section which has asphalt pads and electric (no water or sewer but a nice dump site with fresh water). This area is wooded so there is some shade. The campground nearer to Lake Michigan is tighter with no pads. There were lots of tents there and it looked comfortable for them. Not so much for an RV over 20ft. Mackinaw City is a short drive away and there is a Walmart in Cheboygan but that's about 50 min drive. However, if you are headed to the UP, there are only Walmarts in Saulte St Marie (far eastern area) and Iron Mountain (near WI border). We camped at Wilderness State Park in a Travel Trailer. This is a nice park right on Lake Erie. There are 250+ identical sites with electric only. Water stations are throughout the campground and near the dump station at the entrance. Each site has some shrub/vegetation between for a little privacy. But no shade to speak of anywhere. We pull a 33' TT and there was plenty of room for both out TT and truck. There is a beach right on the lake. 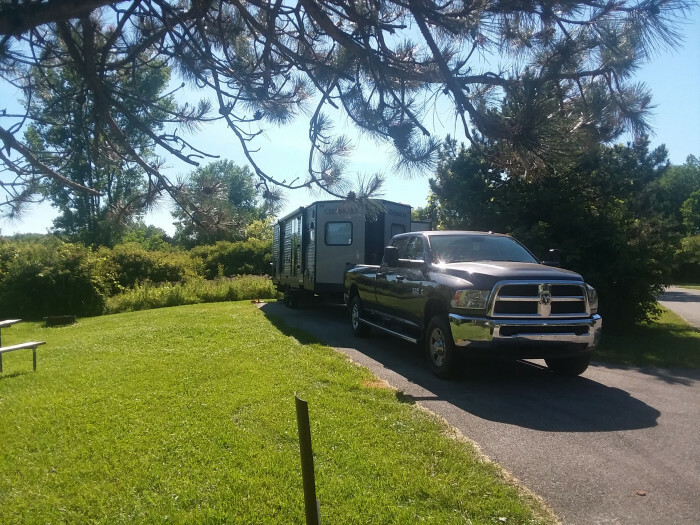 We camped at Maumee Bay State Park in a Travel Trailer. This was my second stay at this park under the new management. The owner is a nice young man trying to attract business. I don't believe he has a website but is very responsive to a phone call or text. He keeps the park clean and it is very quiet despite the fact that it's just of the interstate. There are some long term residents but they are working people who are very quiet. Wifi was recently added to the park and it had laundry facilities. Each site has full hookups so there is no bathhouse. If you are passing through the area or attending a function at Harding Univ, I highly recommend this Campground. We camped at Red River RV Park in a Travel Trailer. This park has lost about half of its spaces to erosion which is sad as it's a very nice park. I would highly recommend it for overnight or longer stays. The city of Texarkana, however, was a huge disappointment. Many buildings are empty and the town looks abandoned. There is a thriving new mall and restaurant area on the outskirts but I expected such an old town to have a historical area. We camped at Piney Point COE in a Travel Trailer. While the park as a whole is very nice, I was very disappointed that the online map, which I used to pick my site, was not accurate. I was in D7 which online was a river-side site. Reality was that it is across a road and large parking lot from the river and, on top of that, is a triple site where the other two sites are very close. Great if you are a group camping but way too close for individual campers - especially in a COE park! Our friends picked A11 which also shows as a river-side site. While it is on the river, that section of the river has a covered boat dock/storage building that blocks all views for at least four sites, maybe more. Otherwise our site was fairly level. We would return but are now better prepared to pick a site that suits our needs. We camped at Maumelle COE in a Tent Trailer. This park is recently under new ownership. The young man is eager to accommodate short term stays. Most of this campground is occupied by long term workers but, after having spent several days, I can say that it was quite during the day and they are all newer rigs. This campground is located immediately off the exit so you can hear interstate noise but leaving our fan on helped that. While there are full hookups, this place is nothing fancy. The sites are gravel but it took very little to level our trailer. It doesn't have a bath house but does have a laundry. It is a great overnight stop or if you need to be in Searcy, just one exit away. Much more convenient than the other campgrounds an hour away. We camped at Red River RV Park in a Travel Trailer.